We do it every year -- put up the tree, decorate the house with lights and pull out the Christmas napery. One of the most enjoyable aspects of the silly season involves decorating your home with a tree, copious amounts of lights, tinsel, plastic gingerbread men and an assortment of reindeer. But aside from the bling, perhaps a true appreciation of Christmas decorations is only possible when we dissect the weird and wonderful reasons they evolved into what they are today. Tinsel originated in Germany in the early 1600s but it was a far cry from the shiny plastic tinsel we use today -- back then it was shredded silver. Real silver. Tinsel makers of the day would hammer the silver until it was thin, then cut it into strips. Nobody seems to have recorded the name of the clever person who invented tinsel but it was so popular, machines began making the stuff to keep up with demand. Eventually people realised the smoke from Christmas candles caused the tinsel to turn black, so later versions were made with tin and lead. That version proved to be too heavy for a Christmas tree, so the Brits took over and came up with the light silver sparkly tinsel we enjoy today. Once again the Germans stepped up in the decoration invention department. Baubles were first invented in Lauscha, by local man Hans Greiner, who first manufactured them in the late 1840s. The first baubles were fruit and nut shaped glass, eventually turning into a more spherical shape. Britain’s Queen Victoria was said to be quite taken with the tradition of baubles and brought them from Germany to Europe in the mid to late 1800s. American retailer F.W. Woolworth made his fortune by importing baubles into the country in 1880. By 1890, he was reportedly selling $25 million worth a year. At first, baubles were only for wealthy people as they were hand-crafted and made of glass. But it wasn’t long before a plastic version was made, allowing cheaper manufacturing and affordability for everyone. In the UK, Queen Victoria declared that it’s bad luck to keep your Christmas decorations up after the 12th day of Christmas, on the 5th of January. Many people continue this tradition -- and it's a nifty way to force family members to start packing up decorations and putting them away for next year. The green fir tree was originally used by Pagans and Christians to celebrate winter. Pagans used branches of the fir tree to decorate their homes during the winter solstice, as it was said to make them think of spring being around the corner. Romans used fir trees to decorate their temples at the festival of Saturnalia and Christians began using the tree as a sign of everlasting life with God. Nobody seems to know exactly when fir trees were first used as Christmas trees but the general consensus is that it began about 1000 years ago in Northern Europe. Many early Christmas Trees seem to have been hung upside down from the ceiling using chains (hung from chandeliers or lighting hooks). In parts of Northern Europe some other early Christmas Trees included cherry or hawthorn plants. They’d be re-planted into pots in the hope they’d flower at Christmas time. For those who couldn’t afford a plant, a substitute was to make a pyramid of wood, which were then decorated to look like a tree with paper, apples and candles. The modern version is synthetic but plenty of people still use the real deal. 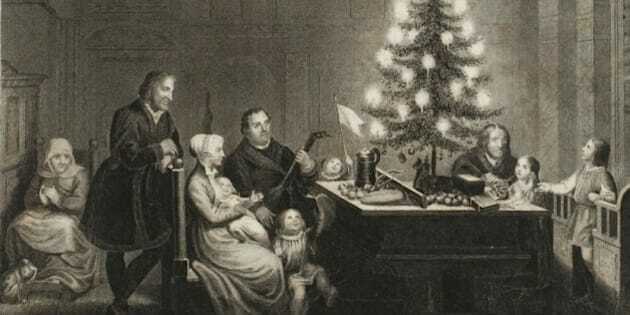 In Victorian times, the tree would have been decorated with candles to represent stars. In many parts of Europe, candles are still used to decorate Christmas trees. American insurance companies in the U.S. tried to get a law passed so that candles would be banned from use on Christmas trees because of the many fires they’d caused. In 1895, an American man, Ralph Morris, was concerned about the fire hazard of candles and Christmas trees so he invented the first electric Christmas lights, which are similar to the ones in use today. Over the years, plastic variations of reindeers, stars, fruit, butterflies, birds and gingerbread men have evolved; from the cheap plastic types to the more expensive glass. Which leads to the debate about whether a star or an angel has the ‘right’ to grace the top of the tree. In this journalists’ family, the Christmas angel has been dragged out of her sleeping place (the box in the shed) and attached to the tree with an elastic band, since the early 1970s until today. Another popular decoration for the home was branches of holly. With their bright red berries, they made a sweet contrast to the white mistletoe. The two were woven together to make Holy Boughs, which were blessed by the local priest, before being hung by the front door. Any visitors would be embraced under the bough as a sign of goodwill. As for the ‘kissing under the mistletoe' tradition, it originated in Britain where the original custom was that a berry was picked from the sprig of the Mistletoe before the person could be kissed. Then, when all the berries had vanished, there must be no more kissing.